Union Pacific announced the commemorative tour schedule for its historic steam locomotives, Big Boy No. 4014 and Living Legend No. 844. The iconic steam locomotives will join together in a public display for the first time May 9 in Ogden, Utah, during Union Pacific’s celebratory event marking the transcontinental railroad’s 150th anniversary. The festivities include recreating the iconic photo taken May 10, 1869, when the last spike was tapped into place at Promontory Summit, creating America’s first transcontinental railroad. Union Pacific no longer has tracks near Promontory Summit. They were removed to support the scrap metal projects during World War II. No. 844 will leave Cheyenne, Wyoming, April 27. It will make several brief stops called whistle-stops in communities along its route, arriving in Ogden on April 28. The Living Legend will be on display at Ogden Union Station through May 11. The Big Boy’s return follows more than two years of restoration. Of the eight still in existence, No. 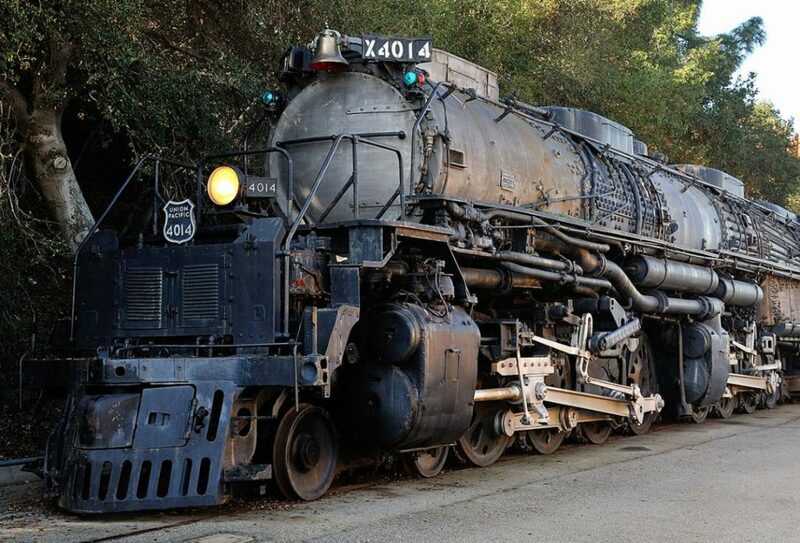 4014 is the world’s only operating Big Boy locomotive. It will leave Cheyenne May 4 following a 9:30 a.m. MT christening ceremony at the historic Cheyenne Depot and arrive in Ogden for the May 9 celebratory event at Ogden Union Station. The Big Boy also will make several whistle-stops in communities along its route. A comprehensive tour schedule, including No. 844 and No. 4014 GPS location tracking information is available at https://www.up.com/heritage/steam/. Due to the dynamic nature of these operations, running times and scheduled stops are subject to change. Arrival 4:45 p.m. MT Rock Springs, Wyo. Authorities have been warned that the latest dangerous invasive species about to descend on Cyprus is the Asian tiger mosquito, which is known to transmit harmful diseases like the Zika virus, West Nile virus and dengue fever. It has already found its way into many nearby areas including Crete, many other Greek islands and the Middle East. Originally from South East Asia, it has spread widely in recent years through the transport of goods and international travel. “It is alarming and all the relevant public health authorities on the island should take immediate actions, especially around points of entry such as the ports and the airports, to catch this mosquito early if it arrives – and it is bound to arrive – in Cyprus,” said Kelly Martinou, ecologist with more than a decade of experience in entomology, biological control, pesticide science and head entomologist at Joint Services Health Unit British Forces Cyprus. 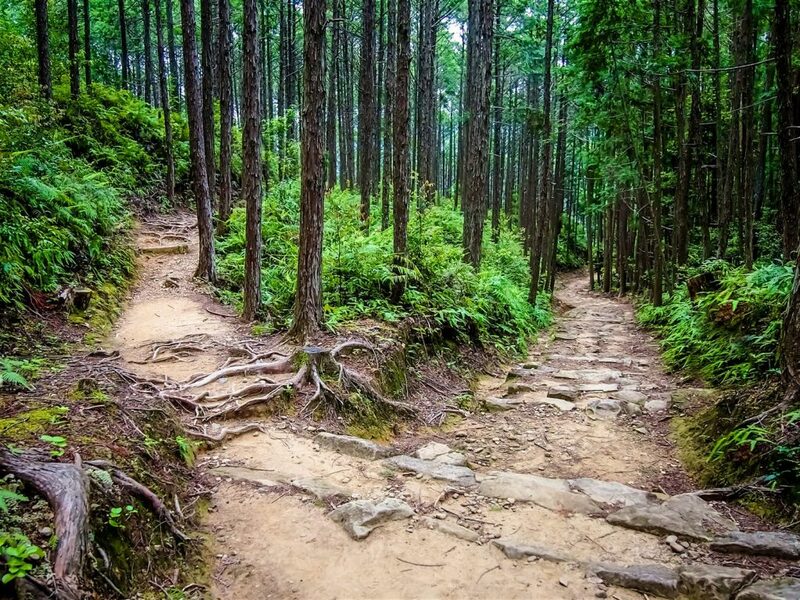 Invasive species are one of the major causes of biodiversity loss, on par with climate change and habitat destruction, and once an alien species is established and spreads it inevitably harms the local environment and may even affect human health. Some have the potential to disrupt vital ecosystem functions, such as water flow, nutrient cycling, or soil decomposition. Others may cause massive amounts of economic damage to the agricultural business by destroying crops and contaminating produce. Which is why the work of RYS-Ky is so important and has just received a new grant by the UK-based Darwin Initiative to continue its work for two more years, starting in May. The two-year project Researching Invasive Species of Kypros (RIS-Ky) was launched in April 2017 and is looking at the impacts of invasive alien species in a variety of habitats – terrestrial, freshwater and marine – in the Akrotiri area. “It requires many years of research in order to understand all the impacts that an invasive species will have,” the researcher told the Sunday Mail. Cyprus with its reliance on tourism needs to take special care that there is no negative impact on human health, Martinou, who is one of the core RYS-Ky researchers, said. One of the important issues which the project pursues is to prevent species, especially ones as dangerous as the Asian tiger mosquito (Aedes albopictus), from entering the country, as once they do, damage control is very difficult. RIS-Ky uses an island wide approach to monitor species that may be a danger to the local fauna and flora and runs a horizon scanning exercise together with many experts from Cyprus and Europe to predict which are most likely to arrive so that early action can be taken to prevent them spreading. Though some species arrive accidentally via ships and planes, and in the Eastern Mediterranean sea, the Suez Canal, others are spread deliberately. The Eastern mosquitofish (Gambusia holbrooki) for example was introduced to Cyprus – and in many other places in Europe – in order to control mosquitos in freshwater habitats. After they were established, Gambusia have been implicated in the decline in the range and abundance of native fish species worldwide through predation and interference competition. When something like this has happened, all that can be done is to inform the relevant public health authorities and the public not to release more of them in new locations. 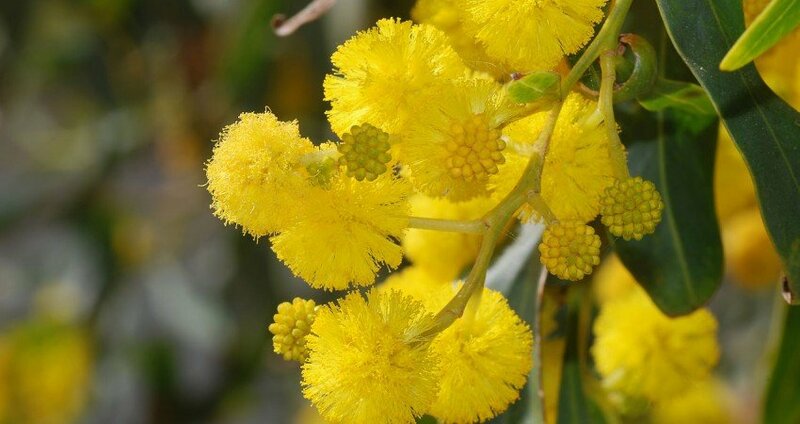 The now ubiquitous Acacia trees, which people tend to like because of their round yellow blossoms and delicate scent, were introduced as fire wood and to dry the marshes around the coast lines of Cyprus. It was not till much later that the negative effects became clear and that the trees are not as innocent as they look. It turned out they grow at the expense of native vegetation, taking over and degrading the local ecosystem. Examples of accidentally arriving species are the silver-cheeked toadfish (Lacocephalus sceleratus) which is extremely poisonous and the common lionfish (Pterois miles), which flourishes as it has few predators, probably because of its venomous spines. The impact of invasive plant species on beneficial insect species such as pollinating insects that are so important for the environment and agriculture is another important aspect the researchers have studied recently, especially since some of these insects cannot be found anywhere else in the world. This is done in collaboration with volunteers who make observations in the countryside and even in their own gardens and then report to RIS-Ky.
“So we use a variety of approaches to gain an understanding of the impact of the invasive species in a Cyprus context but also in order to raise awareness and motivate residents and authorities to monitor and manage invasive alien species,” said Martinou. This will be developed further in future with the help of the new funding. 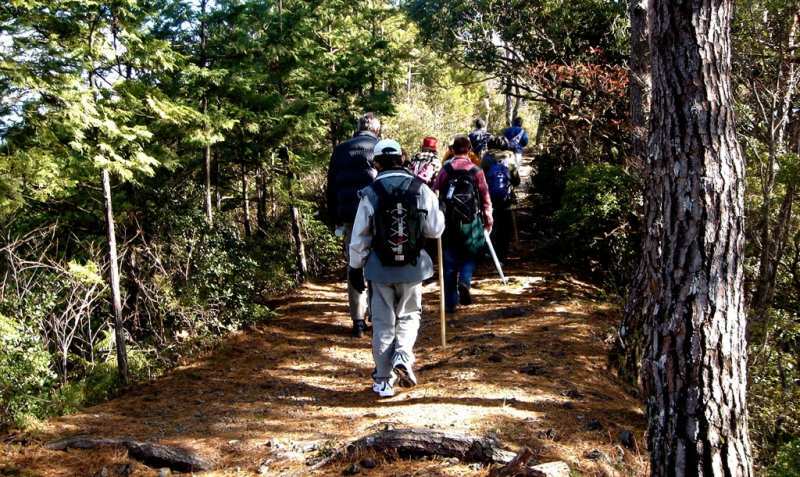 The group of scientists will also try to understand better how environmental changes such as climate change and water availability but also man-made changes, for example urban development, interact with the non-local species and look at the impacts that all these factors have on biodiversity and the services it provides. The invasion of species is a complex phenomenon, and a holistic approach to the research requires the participation of many different people. “We are so many! I might forget some so they should excuse me,” Martinou exclaimed, before providing a long list of collaborators. 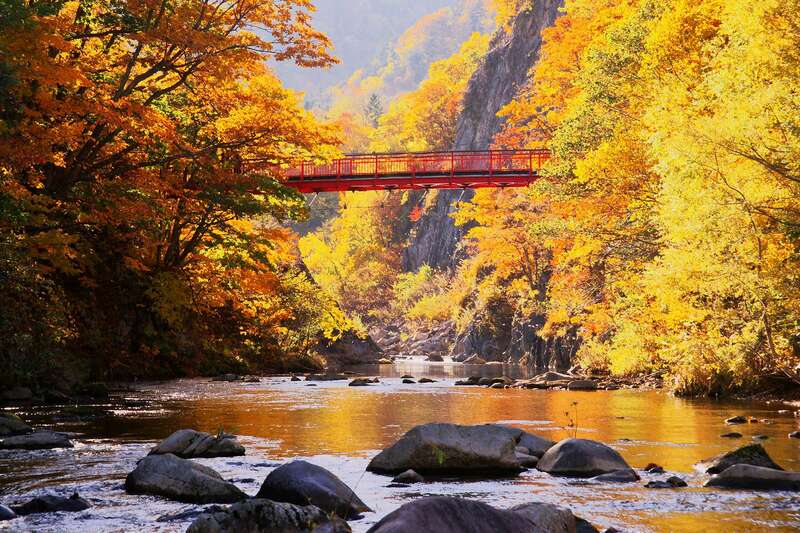 “We have scientists from the Centre of Ecology and Hydrology, ecologists, botanists, entomologists. Environment officers from the sovereign base areas, teachers from the Akrotiri environmental education centre, environment health officers and me as a medical entomologist from the Joint Services Health Unit, marine biologists from the University of Cyprus, and this is just the core group,” she said. Other scientific and environmental organisations include the Cyprus University of Technology, the Cyprus Butterfly Study Group, the Cyprus Institute, government ministries and NGOs such as Birdlife Cyprus and Terra Cypria. “It has been great working together with all these people and for such a complex issue such as the invasive alien species we can only succeed if we work together,” she said. Cave Labyrinth is located 50km south of Iraklion, on a small hill, 3.5 km north of Kastelli village in Messara Plain. It was a huge artificial cave with labyrinthine corridors longer than... 2.5km long and several rooms that did not lead anywhere, which served as a quarry for the extraction of stones used for construction of the Minoan palace at Phaestus, the Minoan villa of Agia Triada, the Roman city of Gortys, and other smaller towns. The quarry and its two entrances were almost completely destroyed by the Germans in 1944 and thus today we cannot see its original form. 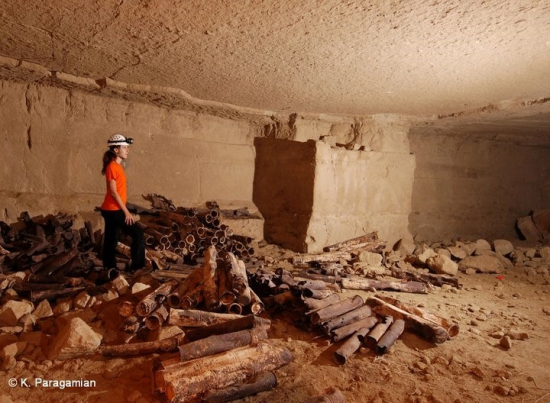 The Cave of the labyrinthine tunnels and the dead ends has raised the interest of many researchers, who place the mythical Labyrinth of the Minotaur in that cave, and not at Knossos. According to the famous legend, Theseus killed the monstrous Minotaur through the dark maze with the help of Ariadne, which gave him a string to avoid getting lost and find the exit again. Thus, Theseus managed to kill Minotaur and free himself and the other people that Athens was obliged to send in Knossos every nine years, in retaliation for the death of King Minos son by the Athenians. Many believe that the myth of the Minotaur symbolizes the suffering and the poor conditions under which slaves worked in the quarry, most of them dying in this dark and damp prison. After the mine ceased to operate, its galleries were filled with bats. Thus, the local residents for centuries came there to load their animals with the nitrate residues of bats, which are an ideal fertilizer. Much later, when the Germans occupied Crete, the cave was used as a huge warehouse for ammunition, food and water. Indeed, it became the largest ammunition depot for Germany, which could supply the entire Middle East, with more than 300,000 tons of weapons! Before the Germans left the island in 1944, they blew up all their ammunition, so the cave was completely destroyed and its entrances were buried under giant rocks. This explosion was so strong that several 15-ton boulders were found within a 10km distance. Επίθεση στο ΠΑΜΕ, την κυβέρνηση και την Ελληνική Αστυνομία εξαπέλυσε χθες βράδυ από την Καλαμάτα ο πρόεδρος της ΓΣΕΕ, Γιάννης Παναγόπουλος, με αφορμή το γεγονός ότι δεν έχει ξεκινήσει ακόμα το 37ο συνέδριο της συνομοσπονδίας. Σημειώνεται ότι την Πέμπτη μέλη του ΠΑΜΕ εισέβαλλαν στο Μέγαρο Καλαμάτας με αποτέλεσμα να ακυρωθεί η έναρξη του συνεδρίου της ΓΣΕΕ, ενώ μετά από νέες εντάσεις την Παρασκευή αναβλήθηκε ξανά. 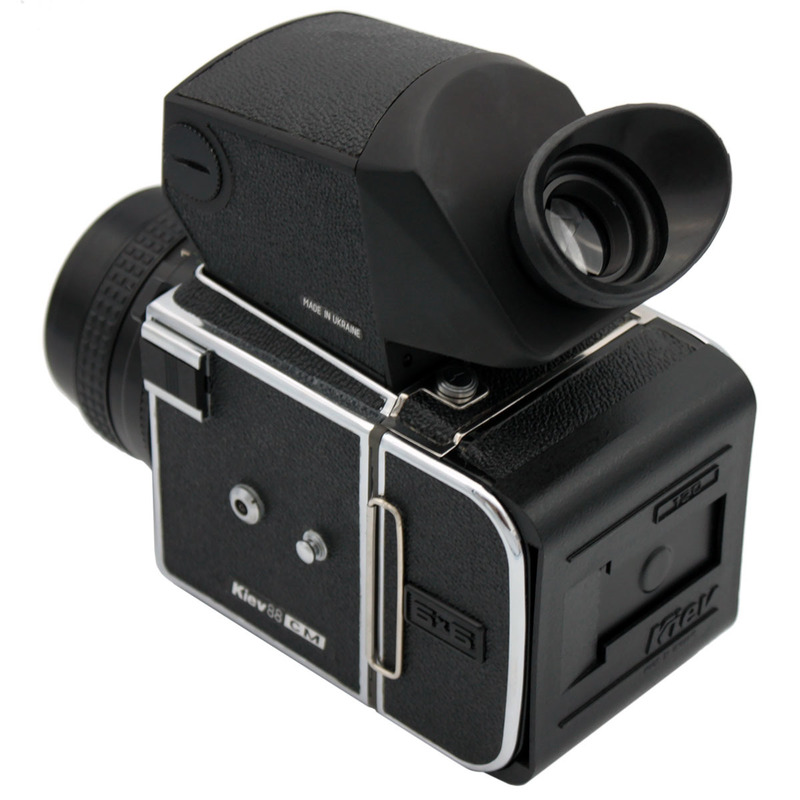 Kiev 88CM Medium Format camera is a classic Soviet medium format camera. The Arsenal film camera is constructed from die-cast aluminum alloy, making it rugged and resistant to scratches, scuff marks, etc. Sporting a unique bayonet lens mount, the Kiev 88CM also has a hot shoe with synchronous center contact for flash mounting. The Interlock feature of the Arsenal film camera ensures that the shutter does not trigger prematurely, for obtaining perfect pictures. The medium format camera's ten programmable shutter speeds, ranging from 1/2 to 1/1000 second, give you control over the precise exposure. For ease of operation, the Kiev 88CM features a waist-level finder with anti-reflection, a pop-up hood and a 2X fine-focus magnifier. • Hot shoe with synchronous center contact for accessories. • Etched hairline grid markings to facilitate accurate image alignment. • Recess to accommodate individual correction lenses. • Flag to signal status of shutler wind. <div>Caractéristiques</div>On peut considérer le Kiev 88 comme un système moyen-format modulaire complet : en effet, tous ses éléments sont interchangeables et le nombre d'accessoires disponibles rivalise avec des marques telles que Hasselblad (la qualité de production faisant la différence). obturateur à rideaux et le relevage de son miroir à la prise de vue, tous deux de grande taille, provoquent d'importantes vibrations en plus d'un bruit peu discret : il est conseillé d'utiliser cet appareil sur trépied. Polaroid, panoramique sur film 120, verre de mise au point. Le boîtier : Kiev 88, Kiev 88CM. Sur le verre de visée : prisme (avec ou sans mesure de la lumière), capuchon de visée, loupe de mise au point. Le fabricant derrière tous les appareils photos de la série Kiev (dont le Kiev 60) est la société d'état Ukrainienne Arsenal, basée à Kiev. Son but premier n'est pas la production de matériel photographique: la majeure partie de sa production est en effet militaire. Le Kiev 88 est le dernier modèle d'une série commencée en 1957 avec le Salyut. Cet appareil photo avait une conception interne très proche du Hasselblad 1600 - certains disent [Qui ? ]qu'il s'agirait tout simplement d'un plagiat. En effet, l'Ukraine était à l'époque une des républiques composant l'Union soviétique : la décision de produire cet appareil avait plus à voir avec la politique qu'autre chose (le monde soviétique se devait de fabriquer des appareils de prestige pour ses photographes professionnels, afin de contrer la réputation de marques "capitalistes" telles que Hasselblad, Zeiss ou autres Rollei). D'autres disent que ces 2 appareils proviennent d'un même prototype allemand trouvé par les armées alliées à la fin de la Seconde Guerre mondiale - bref, l'origine est pour le moins floue[réf. nécessaire]. Le Hasselblad 1600 a été rapidement abandonné par Hasselblad, pour des problèmes de conception dus au choix d'un obturateur à rideaux (même si Hasselblad est revenu plus tard sur ce choix). Arsenal a choisi de continuer dans cette voie, même si la fiabilité posait problème : en 1972, ils sortent le Salyut S, un modèle amélioré avec une nouvelle monture d'objectifs (dite "monture-B"). En 1975, ils introduisent sur le marché une nouvelle évolution, le Kiev 80 : la vitesse d'obturation maximum est plus basse (1/1000 s au lieu de 1/1500 s) mais la fiabilité est meilleure. Enfin, en 1983, le Kiev 88 est enfin introduit (améliorations diverses dans la conception) et devient le modèle le plus connu et le plus utilisé de la série. Plus récemment, Arsenal a introduit un modèle amélioré, le Kiev 88CM. Malgré l'apparence anodine du changement de nom, il s'agit d'une évolution majeure : la fiabilité a été grandement améliorée, un nouveau dos film a été introduit (même si les anciens restent compatibles) et surtout la monture d'objectif a totalement changé : elle est compatible avec les objectifs de meilleure qualité prévus pour le Pentacon Six (elle est appelée "monture C", d'où le nom CM="C-Mount"), dont ceux produits par Carl Zeiss Jena. 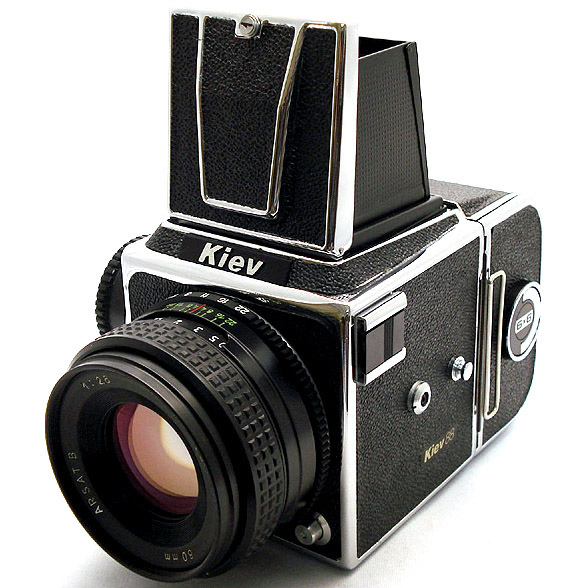 Le Kiev 88 est produit en Ukraine, mais on entend souvent dire qu'il s'agit d'un appareil photo russe. En fait, il faut se souvenir que la décision de sa création remonte à une époque où l'Ukraine n'existait pas en tant que pays indépendant. Les décideurs étaient russes et considéraient l'Ukraine comme russe. Par abus de langage (et peut-être aussi par le fait que peu d'occidentaux font vraiment la différence entre l'Ukraine et la Russie), cette appellation est restée. En fait, le mieux est peut-être de ne considérer cet appareil ni comme russe, ni comme ukrainien, mais comme soviétique, vu que son histoire est très lié à cette période, même si le Kiev 88CM est encore produit (mais pour combien de temps encore ?). Le bas prix du Kiev 88 ne s'obtient qu'aux dépens d'une conception assez hasardeuse. De fait, la réputation de cet appareil est ce qui fait peur à de nombreuses personnes tentées par un système complet pour une fraction du prix qu'il faudrait normalement dépenser. La peur principale est que l'appareil se casse après quelques films seulement, ou même avant d'avoir pris une seule image ! Dire que les Kiev sont sans défaut serait mentir. Ils sont de toute évidence plus fragiles que leurs équivalents de l'ouest. Mais en fait la majorité marche pendant des années sans problème, pour autant que l'on fasse attention lors de l'achat puis de l'utilisation. Des poussières ou poils dans les objectifs. Des fuites de lumière (soit dans le dos film, soit dans le boîtier, soit dans l'objectif). Des réflexions internes dans le boîtier dues à un mauvais traitement des surfaces métalliques. Un espace inter-image incorrect sur la pellicule. Vitesses d'obturation incorrectes ou qui ne marchent pas. Diaphragme de l'objectif ayant une forme « exotique » ou alors n'arrivant pas à fermer au-delà d'une certaine ouverture. Dans tous les cas, il faut savoir que le Kiev 88 demande à être traité correctement, c'est-à-dire : doucement ! Il y a des choses à ne jamais faire, telle que changer la vitesse d'obturation avant d'avoir avancé le film vers la prochaine vue. À l'origine, le Kiev 88 avait une monture propriétaire, dite monture-B. 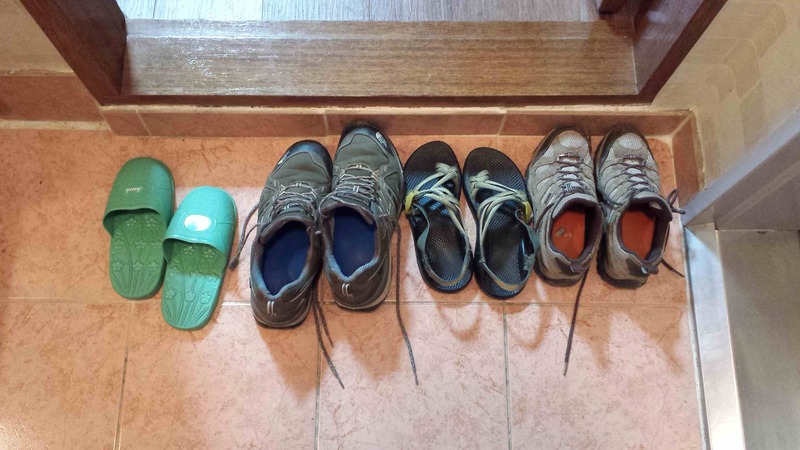 Le choix d'un objectif était alors simple. Un peu d'histoire parallèle : en ex-Allemagne de l'est (RDA), un autre appareil photo moyen-format était développé par VEB Pentacon à Dresde : il s'agit du Pentacon Six, prenant lui aussi des photos 6x6 et ayant sa monture propriétaire. Ses objectifs (produits entre autres par Carl Zeiss Jena) avaient la réputation d'être les meilleurs dans le bloc soviétique. De nombreux photographes auraient voulu pouvoir utiliser ces objectifs avec un système moins figé que le Pentacon Six, tel que le Kiev 88. Quand Arsenal a introduit son Kiev 60 (un modèle similaire au Pentacon Six), ils ont décidé de ne pas utiliser leur monture-B, mais de créer à la place une nouvelle monture (la C) qui serait compatible (mais sans en être une réplique exacte) avec le Pentacon Six. La plupart des objectifs Carl Zeiss Jena étaient utilisables avec le Kiev 60 (mais certains demandaient une petite adaptation). De plus, Arsenal a dupliqué toute sa gamme d'objectif pour le Kiev 88 vers une monture-C. Bref, cette monture devenait de plus en plus attirante car elle offrait un vaste choix d'objectifs, dont certains de très haut niveau. Avant l'introduction du Kiev 88CM, des revendeurs se sont mis à offrir des modèles modifiés du Kiev 88 avec une monture totalement compatible avec le Pentacon Six. En créant ce Kiev 88CM, Arsenal n'a toujours pas offert une réplique parfaite de la monture du Pentacon Six, mais sa monture-C plus limitée. Bref, à nouveau des revendeurs ont offert la possibilité d'améliorer cette monture pour la rendre totalement compatible. Le Kiev 88 a sa propre monture (B) et certains revendeurs la changent pour une monture totalement compatible avec le Pentacon Six. 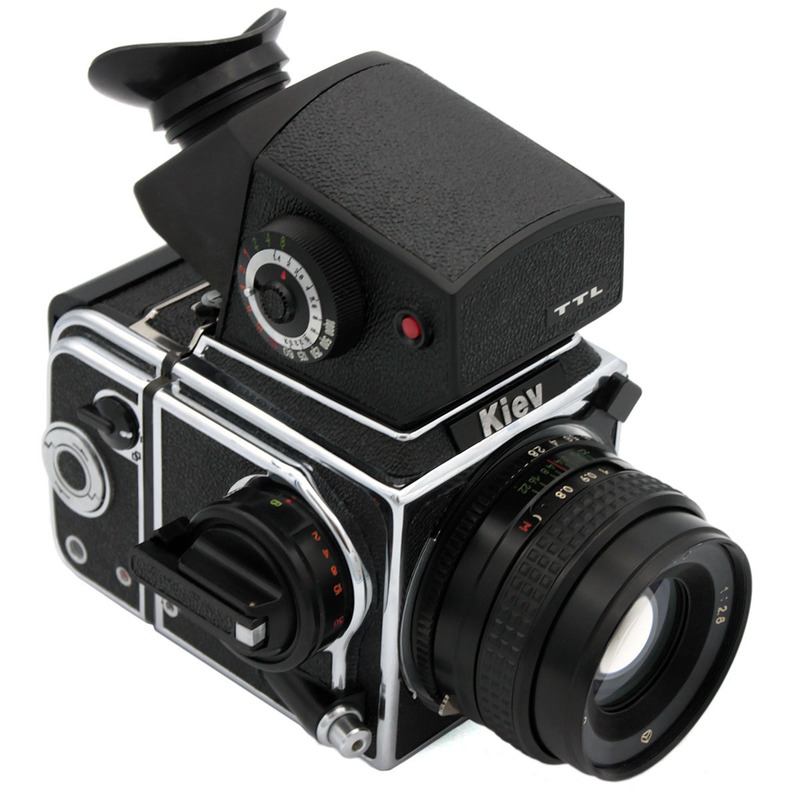 Le Kiev 88CM a une monture (C) vaguement compatible, que des revendeurs rendent totalement compatible. Bref, se renseigner avant d'acheter. Dans le milieu des années 1990, cet appareil a gagné une certaine popularité à l'ouest, entre autres grâce à la propagation d'Internet permettant d'acheter directement dans des ex-pays du bloc soviétique. Vérification des différents éléments internes de l'appareil (pour compenser le peu de contrôles d'usine) et réparation en cas de problème détecté. Ajout de traitement interne mat, pour éviter des réflexions parasites. Installation d'une fonction permettant de remonter le miroir avant la prise de vue. Ajout sur le boîtier d'un cuir de meilleure qualité. À noter : certains revendeurs remplacent la plaque portant le nom « Kiev » par leur nom (Arax par exemple), ce qui peut prêter à confusion.